When we speak of postcolonial literature, we rarely think of contemporary writing from Bangladesh. Because when we speak of postcolonial literature, we really wish to, while soliciting the idea of freedom, but literature in a sort of box. Thus India, in seeming “Asian” with respect to Britain, Pakistan, in seeming “Muslim” with respect to the West, can seem conveniently othered, eroticized. Bangladesh, although equally colonized by the British with the other pars of South Asia, won its freedom struggle not from non-Asians or non-Muslims, but from Pakistan itself. Moreover, the leading writers of Bangladesh have been skeptical and anti-fundamentalist, and have not incarnated the naïve challenge to Western values that many would, out of a mixture of motives, like to see from the Muslim world. One of the most vigilantly skeptical of these writers is the late Humayun Azad. It is all too sorrowful that Azad, whose most poignant poem began “I Probably Will Die For A Little Thing,” died for a big thing: he was assailed by fundamentalist terrorists in 2004 and died of his wounds shortly thereafter. Yet Azad’s personal courage and suffering threatens to take the spotlight away from his poetry, as did his copious production as an essayist and scholar. 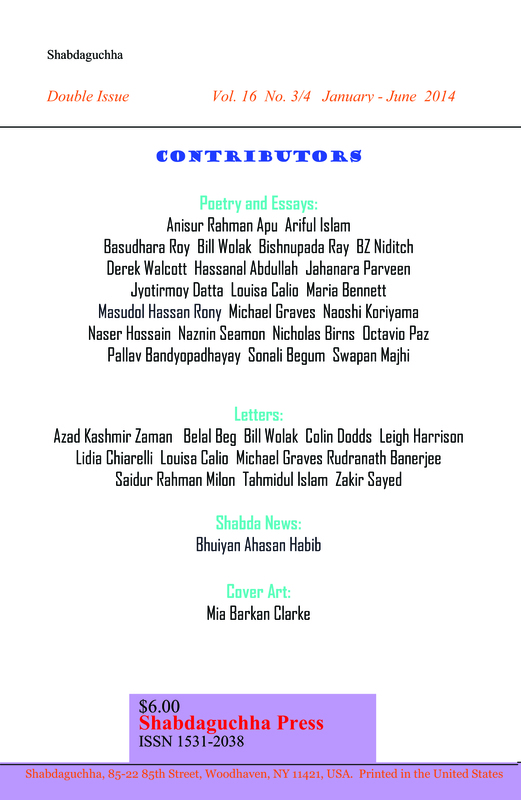 Hassanal Abdullah, who has virtually singlehandedly made the poetry of contemporary Bangladesh visible in the United States, here provides a copious selection of Azad's poetry in English translation, providing a volume of so much richness and depth it is impossible to fully celebrate it in this limited space. This anthology was co-published by Korean Expatriate Literature and Cross-Cultural Communications in the spring of 2013, including poetry by 15 American poets, 20 international poets, 24 Korean-American poets, and 16 Korean poets, 75 poets in total. It is very significant that the book has been published through the cooperation of American poets, Korean poets in America, and Korean poets in Korea. Yoon-Ho Cho, one of the co-editors, writes in his Foreword: “The globalization of Korean Literature is an important task for Korean writers to accomplish.” He goes on to say, “To this end, we may consider the quality of Korean literary works, the excellence of translations, and literary exchange with the writers of the world.” This anthology has poems of different styles and subjects by international poets of different backgrounds. There are some difficult poems for me, but let me introduce some poems I thought interesting.